Those are not my words, and frankly, I am not sure that I even believe that, but it is pretty much a universal belief among politicians and the political class. So as we watch another hurricane slosh ashore, we are inundated with news about how people are suffering and in danger because of… ? Hurricane Florence has sloshed ashore. A day or two ago we were told that this would be the worst storm in all of human history. It’s not even close, probably not even in the Top 10, but that hasn’t stopped the whole idea that the first duty of government is to protect us from being inflicted. Protect us from what, exactly? Ben runs up the rocks! 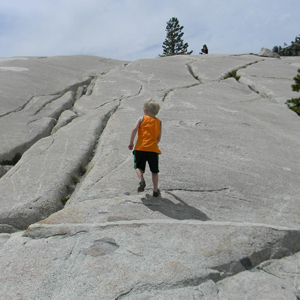 Dave and the family head out for the top of Tioga Pass in Yosemite, while the Duggar family heads out to an interview with Megyn Kelly on FOX news. One trip was a blast, the other promises to be an exercise in futility. The State Senate President doesn’t want to talk about his hiring of two State Retirees to drive Drunk Senators home in the middle of the night. But he does want to get on his soapbox and whine about One Person One Vote, which is basically his own power structure. The GOP has an opportunity here to really unite the base and show what they believe. Will they take it? Not a chance. But in the process, Dave discovers why he disagrees with Ron Paul (and by extension, Rand Paul). The biggest problem with politicians, regardless of party or what they say, is that they do believe that once they are in office, they are above the law and better than you or I. When a politician gets a DUI, which, as you know I believe is attempted murder, they should resign. Period. No debate, no discussion, no further argument. I am even willing to wait until they plead it down to Wet & Reckless, but the point is, they have lost the public trust and they should have the personal conviction and courage to do the right thing. Instead, they choose to twist intentions, rules, laws and even their own words until they manage to portray themselves as the victim. We’ve seen this here in California with Senator Ben Hueso, but we aren’t alone. In Kentucky, a State Senator was popped for DUI. His argument? It isn’t that he “didn’t do it,” or even that he could plead it down to whatever the equivalent of Wet & Reckless is in Kentucky. Nope, he is claiming “Immunity” under the Constitution. Yep. He is claiming that section 43 of the State Constitution, which mirrors Article 1 section 6 of the US Constitution, EXEMPTS SITTING LEGISLATORS FROM ARREST, except for treason, felony or breach of the peace. This losers argument is a legal machination designed to excuse him from doing what would put you or I, were we to visit the beautiful Commonwealth of Kentucky, in jail. And he’s doing it with a straight face.